I came across these interesting toys on a website called A Mighty Girl. Their mission is to promote books, movies, music, and toys that empower girls to become "smart, confident, and courageous." A Mighty Girl also empowers parents to be more proactive and conscious of the ways in which they can raise their daughters, nieces, granddaughters, etc. I love this website and was happy to discover that they had a couple of steampunk toys so if you have a daughter you'd like to empower (or even a son, nephew, or grandson)--here's a couple things Santa can bring on down the chimney (or they can receive one of the eight nights of Hanukkah)! Timeline (seriously cool game of trivia about inventions & patents)--Great for all ages! 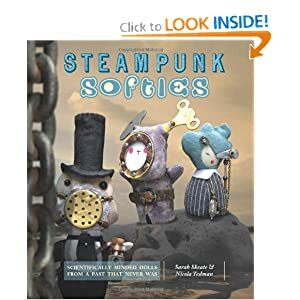 And of course, you could make your own Steampunk plushies following the excellent directions in Skeate and Tedman's Steampunk Softies. You could also alter toys or toy DIYs and steampunk them--like the Steampunk Teddy Bear I made!